Brazil is a colourful, magnificent country in South America. Why not enjoy a peaceful, relaxing in our five star hotels? Ice cold drinks will make you feel so refreshed. Take some memorable photos of the towering historic statue of Christ the Redeemer. But that’s not all. Explore the nature by visiting the landscape of the Amazon rain forest. You will never forget your visit to Brazil. Do you want to discover the secrets of the Amazon Rainforest? The Amazon Rainforest is the largest rain-forest in Brazil where you can discover the layers of the natural habitat. Learn each animal secret by visiting this exciting experience. Observe tiny bugs and insects to colourful birds and butterflies. Also, investigate underwater where it is crystal clear. Come face to face with the cheeky spider monkeys that will almost make you laugh. It is an opportunity you will never forget. Do you want to taste the Paradise? Then why not visit our five star luxury hotels and take a dip in the crystal clear water. Step into the warm golden yellow sand and feel the tan of the relaxing sunshine. Dive inside the shallow water and explore the local habitat and observe the marine life in their natural environment as you go swimming underwater. As you stroll across the yellow beach, you can feel the sand massaging your feet. Come to the brilliant Brazilian Carnival! Do you wish you could stay late and just dance? Then, why not visit the world’s biggest and greatest carnival, “The Rio de Janeiro Carnival”. The carnival is in Brazil and starts on February. It lasts about three days. The infectious Samba beat will almost take your breath away. You won’t be able to resist stopping dancing. Don’t just dance in the carnival, be the carnival. Last but not least, its about the Brazil's climate. Brazil’s exotic climate makes an ideal holiday destination. It has an average winter temperature of 15°C whereas scorching summer has a temperature of 40°C. In Brazil, winter only lasts about three months (June to August). Summer arrives on December and lasts till February. Yes, Brazil has something for everyone. So, any thoughts on your mind on visiting the colourful and full of life Brazil? 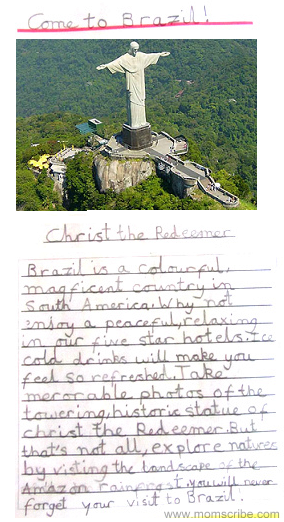 "The Brazil Experience" is a leaflet written by my daughter Cherry (8 years old) persuading the readers to visit Brazil. Her works are indeed special to me and is something I loved to share in my blog under the "Kids Space". 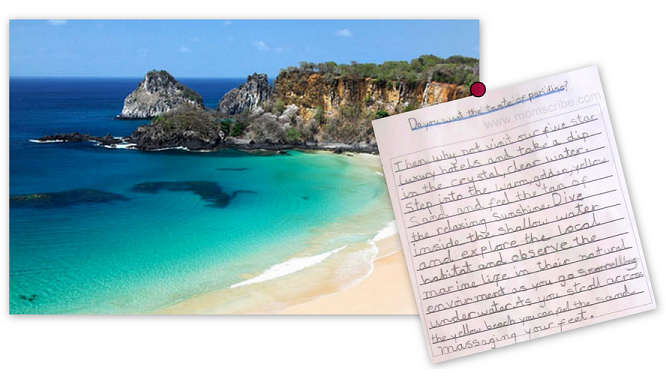 I hope her thoughts will persuade you, most my readers to take a short vacation to Brazil as well. Wonderful post by a 8 year old! Great efforts , God bless him. I love the way you have presented the letters. Glad that you have encouraged the little girl by posting her write up.Very descriptive for a child of eight years old.Congratulations! I was wondering who wrote them in papers and why. and then in the last you revealed it! Such a cute write up by your daughter.Lovely handwriting.